The cacti Astrophytum ornatum (upper cactus) and Mammillaria hahniana (lower cactus) are commonly cultivated as ornamentals. In the wild, they occur in a rich community with many other plants. 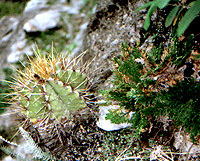 In this photo taken on a steep limestone cliff, the cacti are growing with ferns, liverworts, and Commelinaceae. The green fronds on the middle right are the a club moss Selaginella.